Bait and tackle preparation is an important aspect of my approach to any session, especially bait. As per usual, my preparation for this session began a week in advance, and my Tuesday night was dedicated to rolling bait. For this specific session, I decided to test a new variation of my standard, homemade boilies. On the Friday, after work, we set off to our chosen swim on the Vaal River. I hadn’t fished the swim in the past, but from what I could gather from the local anglers, it was deep water and a few decent fish have been caught here in the past. Before the sun had set completely I had the marker float out and was sketching an image in my mind of what was lurking beneath the surface. No real features nor variations emerged; it seemed to be pretty flat with a nice and solid bottom, presumably clay or sand. As with any other session, I baited my swim with homemade guava and kiwi boilies – around 2kg initially – and the rods were out by around 22:00. Expecting to be busy the next day, Twane (my partner) and I hit the sack soon after. Just after midnight, we were woken by what sounded like a large animal swimming down the river. All the alarms were beeping, so naturally I got up to see what was happening, and what I saw was pretty spectacular: a massive school of catfish were feeding on the surface. It really was something amazing and pretty terrifying at the same time. That many catfish in the area – it surely meant they would clean us out. Sure enough, the first five fish during that night were all ‘cats’. Regardless, after every run we fed more boilies. The morning light had us out the bivvy very early, but the warm sun had no intention of hanging around. Heavy clouds moved in and covered the skies above us – rain was the order of the day and it stayed around for pretty much the rest of our session. Our anticipation was building as we could see some carp crashing the area we baited up. Keeping an eye on the barometer the whole time, it was looking promising for some action during the day. To my total surprise, we had no fish during the day, although they were consistently showing up in the area we baited up. Changing the sensitivity settings on my bite alarm to the most sensitive, allowed me to determine that they were in fact feeding in the area as we had regular line bites. That made me think – we were missing something. I decided to change my strategy and re-baited at around 14:00. Looking at the baits that had been in the water for a few hours, it was clear that they had been laying in silt. They had the distinct smell of silt, and were much darker in colour. I had the marker float out again, and realised that there was a very thin layer of soft silt on top of the river's solid bottom, which I had missed initially. From past experience, I know that silt is often a good area to fish, but it requires different tactics to adapt to the silty bottom. I changed my hook baits to an 18mm boilie, tipped with a single unflavoured popup on both my rods. On the other rods, we used baits glugged in the same liquid foods that were used in our boilies. The popups were balancing the hook baits perfectly, keeping them just above the silt. The theory with glugged baits is that the silt smell won't absorb into the bait. During the day we kept feeding with the throwing stick, and by sunset we had fed around 5kg of boilies in total, and still had no carp to show for our efforts. This changed quickly after sunset – my right-hand rod tore off at around 19:30. On pick-up, it immediately became clear that it wasn't another catfish. The result was a beautiful river common of around 8kg. As we released the fish, the middle rod also screamed off. Unfortunately, the fish managed to shake the hook. It became quite apparent that we made a vital mistake during the first part of our session. By 22:00 all our rods had seen some good action, but none of the catches were really big carp though. We had an unbelievable last 12 hours, landing around ten carp and zero ‘cats’. The average size of the carp was around 8kg, and sleeping seemed to be a luxury for the rest of the night. Getting up for a screaming take every 30 to 40 minutes was taking its toll on us. Tired and soaking wet, we called it a weekend early that Sunday morning. I learned a valuable lesson that weekend – attention to the smallest details could be the difference between a session of a lifetime or a blank. It is crucial to use every available resource to your advantage. Pay attention to what’s potentially happening under the surface by inspecting hook baits that have been in the water for an extended period of time. 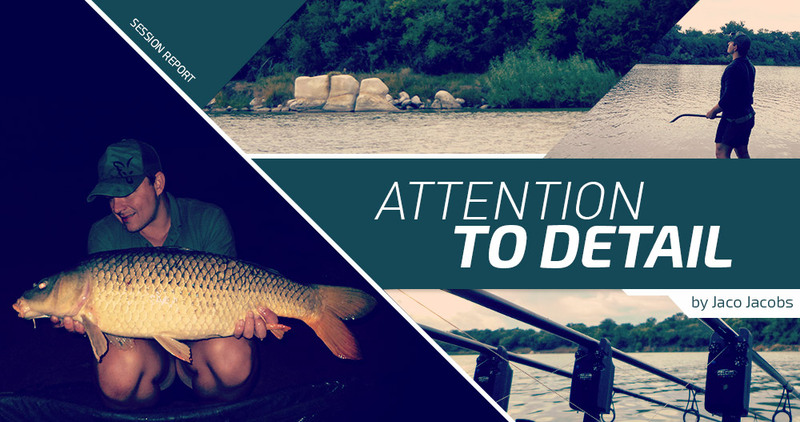 Keep an eye on the weather – try to anticipate what the weather could do to the carp’s behaviour.